Mr Speaker, Mr Speaker. Mr Speaker. Jeers: to an inaccurate public record. It behooves us, Mr. Speaker, to point out, Mr. Speaker, that the official record, Mr. Speaker, also known as Hansard, Mr. Speaker, seems to be inaccurate, Mr. Speaker. Specifically, the House of Assembly transcripts are missing several utterances of “Mr. Speaker.” The annoying habit of some members has been glossed over by whoever is writing things down. In a series of answers by Services NL Minister Tony Cornect last week, seven utterances of the term became one in Hansard, then seven became one again, then nine became two, then five became three. If you read the record, you would think the minister only occasionally uttered the term, rather than repeating it ad nauseum. Some shorthand is understandable, such as non-recognized members saying the generic “Hear! Hear!” But this practice leaves a false impression about what was said — or, more accurately, how it was said. So that got a body wondering: is the Bow-Wow Parliament, as many observers sense anecodotally, getting misterspeakerier? Mr. Speaker, the answer, Mr. Speaker, is yes, Mr. Speaker. 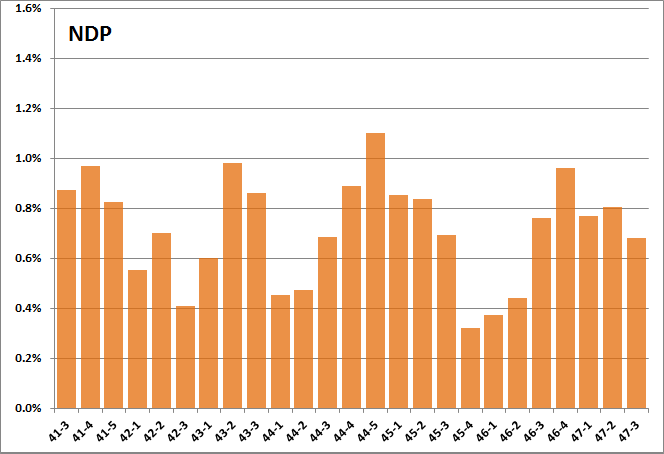 For the purposes of this exercise, misterspeakeriness is measured in the number of instances of "Mr. Speaker", as well as "Mr. Chair/Madam Speaker/Madam Chair", uttered in debate of the House, including when it is resolved into Committee of the Whole, by identified ordinary Members, expressed as a share of total words spoken. "Identified ordinary Members" means that the words of the presiding officer are excluded, as are those of unidentified Members ("Some Hon. Members" or "An Hon. Member"), and those uttered by non-Members, such as the Clerk, the Lieutenant-Governor, or guests. 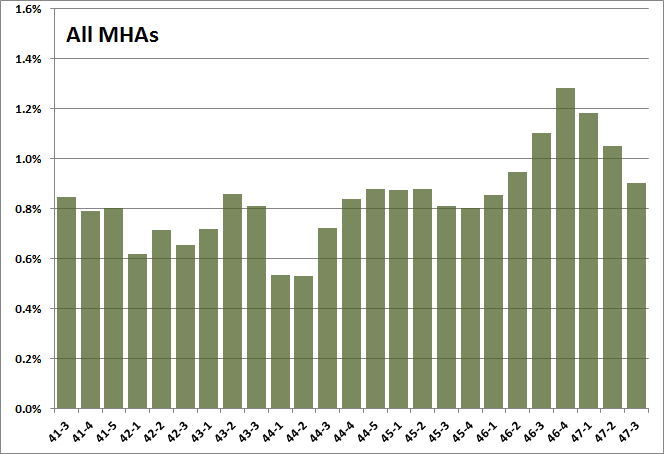 This chart shows the misterspeakeriness of debate, as recorded in Hansard, in each session of the House of Assembly since Hansard records begin in HTML format. 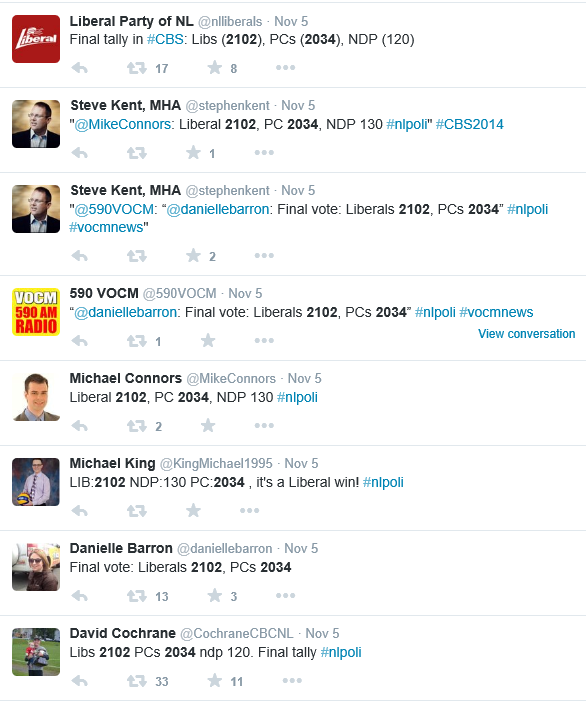 It has now been over a year since the provincial by-election in Carbonear–Harbour Grace, the second of two provincial by-elections, the other being Cartwright–L'Anse au Clair, held in 2013. 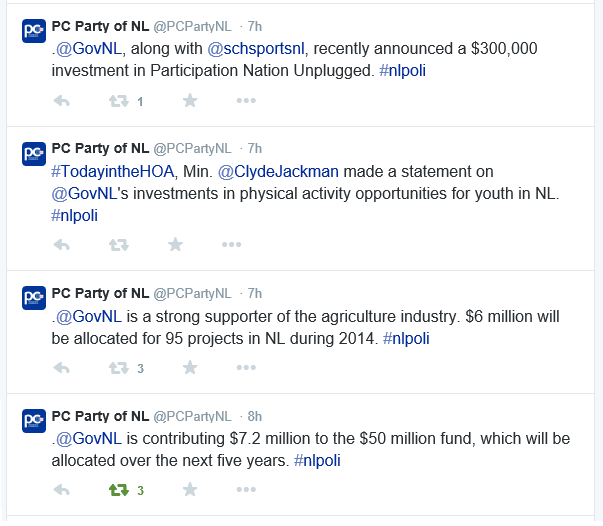 Over at Elections Newfoundland and Labrador, there is no sign of the candidate financial disclosures for either of those two by-elections. Naturally, neither is there any sign of the party contribution disclosures for 2013 – an ongoing, well-documented lassitude at the electoral agency. And the report, mandated by s. 299 of the Elections Act, which requires the agency to produce a report documenting contributions made to parties during the campaign period? The report for the 2011 provincial general election is still not available – assuming it was ever created – more than three years after that election was held. On the electoral administration side of things, there is also no sign of the poll-by-poll return for the St. George's–Stephenville East by-election, which was held three months ago. 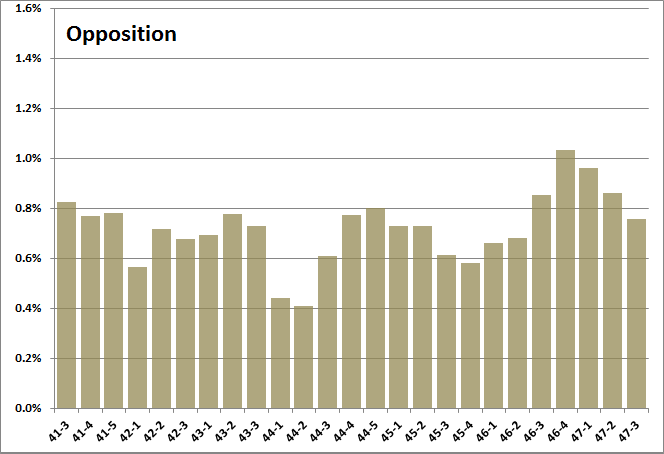 A grand total of 3738 votes were cast in that by-election. 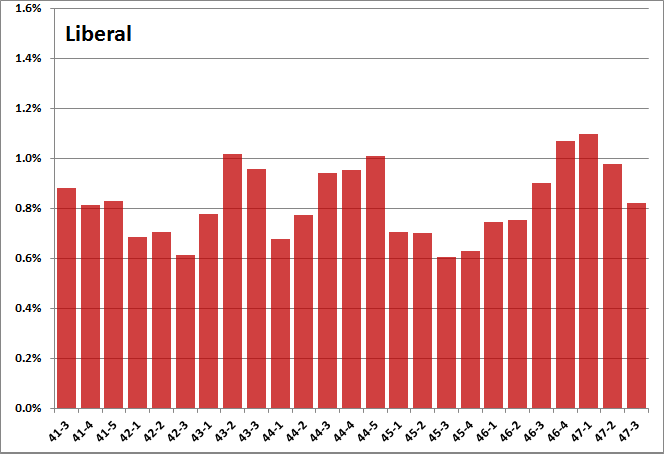 By contrast, Elections Ontario published full poll-by-poll results for June general election for the entire province — nearly five million votes cast in nearly 25,000 polling divisions in 107 electoral districts — the week after the election was held. In Quebec, DGEQ released full poll-by-poll results of the April provincial election in May — 4.2-million votes in 125 electoral districts, subdivided into about 18,000 polling divisions. In both cases, the provincial electoral offices released the detailed poll-by-poll results in machine-readable format, which allow researchers to use the data, and marry the numbers to cartographic files. 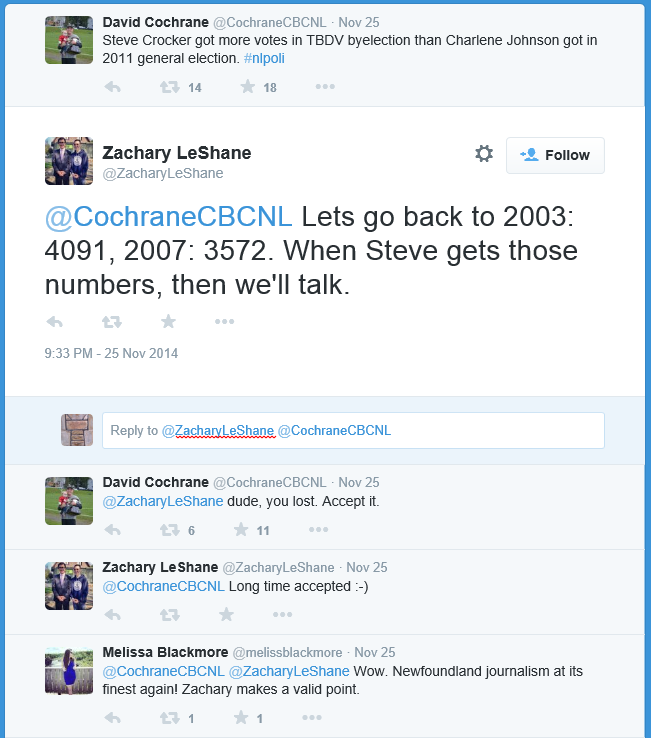 Elections Newfoundland and Labrador? When the do eventually get around to publishing the figures, such as those for Virginia Waters, more than five months after polls close, their format of choice is... PDF. Don't even dream of getting the polling division boundary files. 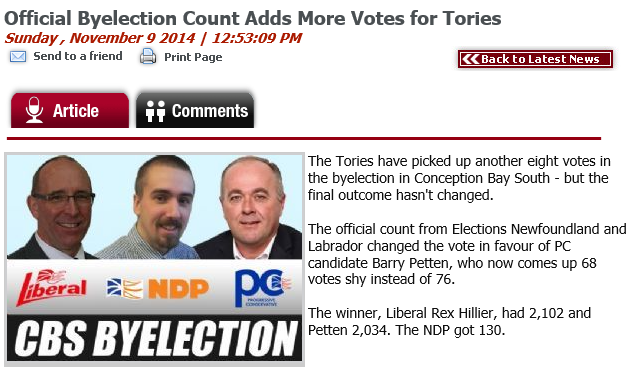 What, on earth, is wrong with Elections Newfoundland and Labrador? In percentage terms, Crocker had the largest vote-share of any Liberal candidate in the district ever; it was larger than two of Johnson's three personal majorities; and was second only to her blowout in the 2007 Tory landslide. 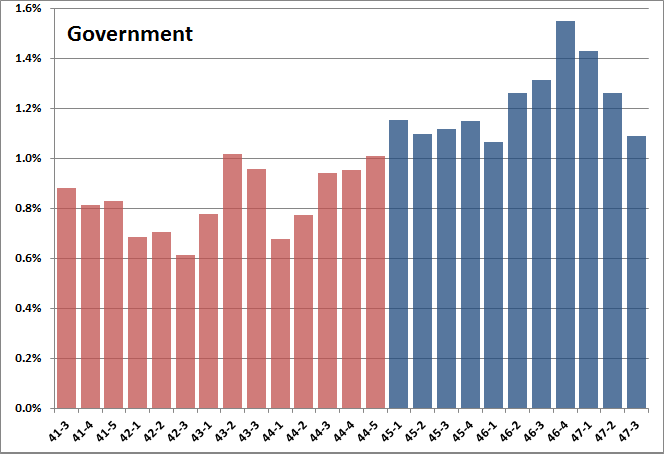 General elections results of 2011 on the left. 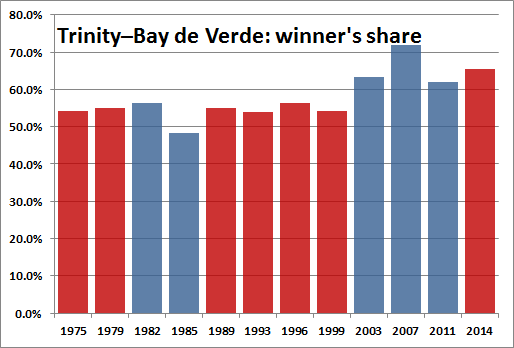 Current standings (including provisional November 25, 2014, by-election wins) on the right. On Nov. 18, 2010, Premier Danny Williams presented - and Premier Kathy Dunderdale has continued to support - the 13-page agreement providing details of the partnership between our government, Nalcor Energy, and the Government of Nova Scotia and its Emera energy corporation, and confirming the partnership between Nalcor and the Innu Nation of Labrador. If this proposal is put in place and implemented, the result will be the development of Muskrat Falls. 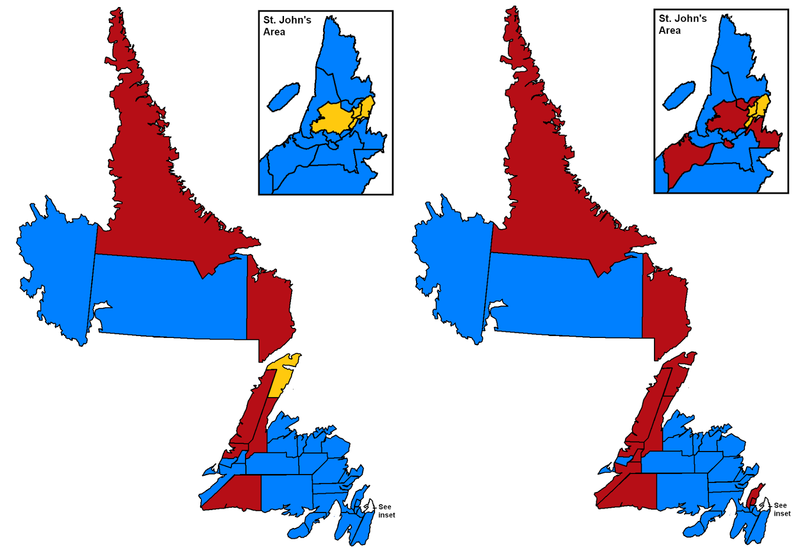 The power would be transmitted from Labrador across the Strait of Belle Isle for use on the island and to provide power for the future industrial development of Labrador, as well as providing hydro power for Nova Scotia or the Maritimes generally, or perhaps New England. Then premier Williams stated that the agreement reached was a day of great historic significance for us because we can now move forward with development of the Lower Churchill on our own terms, free of the geographic stranglehold which Quebec has had for far too long in determining the fate of the most attractive clean energy project in North America. I consider Muskrat Falls the last and best chance we have to overcome the disastrously unfair provisions of the original Upper Churchill agreement and to develop Labrador energy and resources effectively. There is risk in every great enterprise, but the issue is whether the risks are reasonable or not. This 824 megawatts of power can be produced from clean, renewal resources, with interconnections to the Atlantic provinces and, if necessary, to the northeastern U.S. - enabling all to benefit from environmentally friendly, affordable energy. It will cost us greatly if the Muskrat Falls project does not proceed. A reasonable assessment is that it will result in stability and less cost for consumers in the long term. The Maritime link will be owned first by Emera for 35 years, reverting to us. As T.S. Elliott once observed: "Only those who would risk going too far can possibly find out how far you can go." Newfoundland and Labrador is in a vulnerable economic situation according to John Crosbie, who blames the Danny Williams/Kathy Dunderdale governments for failing to reduce spending while oil prices were high. At the Newfoundland and Labrador Employer's Conference, yesterday, Crosbie said government failed to acknowledge the volatility of oil prices and continued with large spending increases and budget deficits, despite the need for restraint during those years. He says buying into offshore oil fields and Muskrat Falls depends crucially on the future price of oil. As a result, Crosbie says our exposure to risk is huge, and more than it needs to be. He says spikes in oil prices are inherently unpredictable, leaving us in economic risk. Businessman Bill Barry furthered Crosbie's point, saying government is in no position to assess risk, and has jeopardized our economic future. He says we operate in one of the most expensive resource areas in the world, and our public policy does not reflect that. Barry says we're not making investments, we're taking risks. While it's great to invest in our future, Barry says we shouldn't risk our future. He says the people who are making these public policy decisions are in no position to assess risk. Such debate / many legislation / amaze! No sooner was the Bow-Wow Parliament back in session for the fall, than a government minister was whining that the opposition were actually trying to do their job. MS SULLIVAN: ...For right now, of course we know that we are looking at Bill 25, An Act To Amend The Elections Act Of 1991. A little surprising to me some of the commentary that I am hearing regarding what seems to me to be a housekeeping item that we should be able to move through fairly quickly, particularly given the fact that the three parties – as the Leader of the Third Party just said here in the House – have already met around this, they have already agreed to this amendment and they understand that we simply need to move forward and get it done. It is a little surprising to me that we need to have this much debate in the House of Assembly regarding this particular act. We are simply about correcting a human error, Mr. Speaker, that which can happen any time to any one at any place. A human error. Just like that time Danny Williams expropriated a polluted, shuttered paper mill. 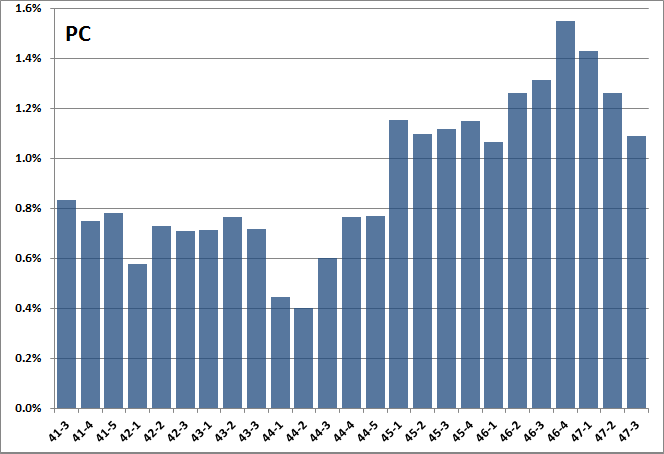 And for the record: the governing PC caucus put up seven speakers on Bill 25, speaking 6761 words as recorded in Hansard, for 36% of the debate. 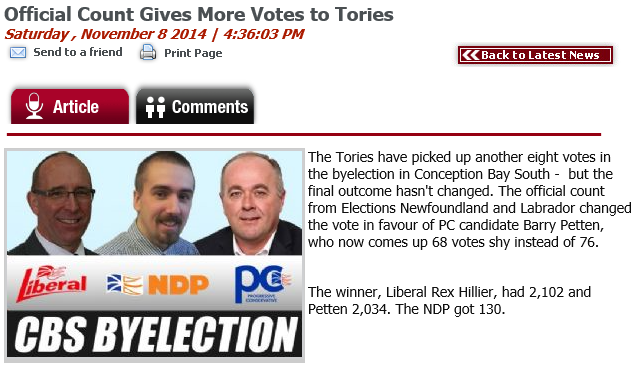 So there was a by-election on November 5th in Conception Bay South, and after all the unofficial counting was done, Elections Newfoundland and Labrador pegged the preliminary result as 2102 to 2026 for Liberal Rex Hillier. On Saturday, the Elections agency released the official count (which is not, as some people think, a recount), which modified the result to 2102-2034. The winner remained unchanged. 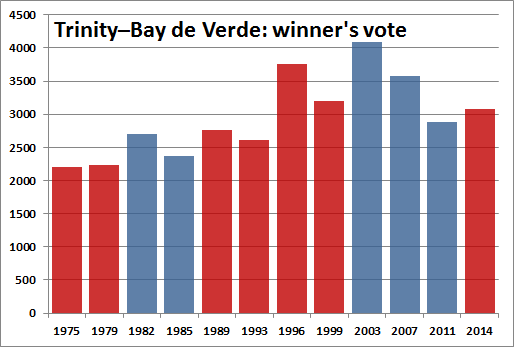 All of which is to say that, between Wednesday and Saturday, the only people who had the incorrect vote-total in the Conception Bay South by-election, were the people who are actually in charge of administering by-elections.